During WW II, Aircraft # 729, or T Square 54, was based at Saipan Island, assigned to the 875th Bomb Squadron, 498th Bomb Group, 73rd Bomb Wing, 20th Air Force. 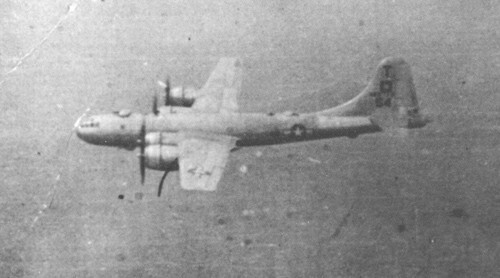 She flew 36 missions against Japan; in the clearer of the two airborne pictures she is shown dropping 500 lb. bombs during one of those missions. 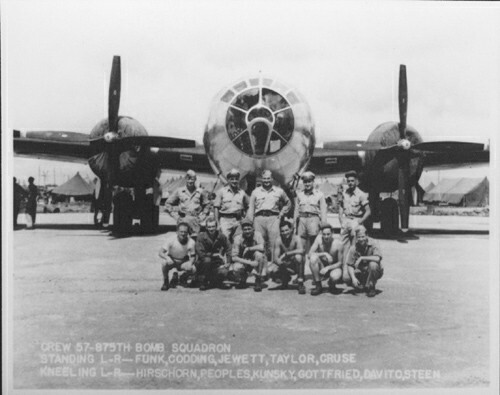 Above is the crew of T Square 54, stationed at Saipan Island during the war. James Funk (standing 1st from left), James Taylor (standing 2nd from right), and William Gottfried (kneeling 3rd from right) were present at the Lowry AFB dedication ceremony on Oct. 2, 1987. The picture above shows 729 on a mission to Japan. The above photo shows 729 dropping 500 lb. 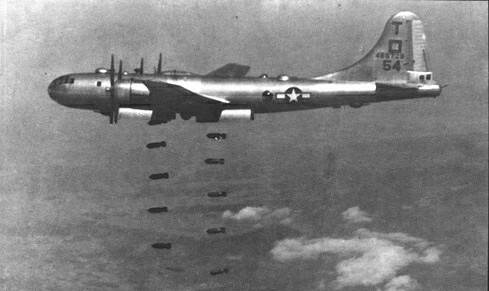 bombs over Japan.